After the courtship flights and mating rituals are complete, the end result of course is nesting hens. 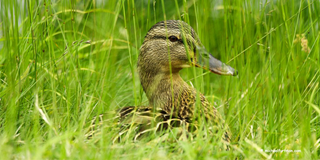 Every apartment complex pond, golf course, park and even some swimming pools can become targeted nesting areas for hens looking to raise ducklings. 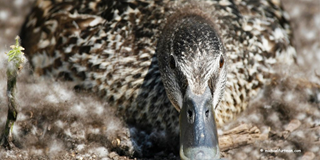 Ducks and geese have been known to think outside the box when it comes to finding a safe place for a nest, while others seem to not be thinking at all. Soon, people all over the country will begin finding nesting birds. Knowing what to do, and most importantly what not to do, with and around the nest is very important. There are many laws and treaties that protect migratory birds. 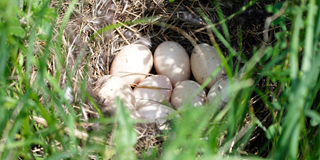 It is ILLEGAL to take or possess eggs of nesting migratory birds without the proper permits! The nest bowl is 7-8 inches in diameter and 1-2 inches deep. Once the nest is built, egg laying will begin from 1-3 days. Nest cover can be any form of vegetation available within the area. Preferably dense vegetation 24 inches high, such as native grasslands and CRP fields. The hen will lay an average of 9 eggs which will hatch within 28 days once incubation begins. DU conservation biologists highly recommend that you leave the nest undisturbed and try to avoid walking in its area. Too many ducks and geese on your property? Contact your state fish and wildlife agency. Problems with nesting Canada Geese? Stories will soon begin to spread about the goose that chased the jogger through the local park, or tried to attack someone who was trying to hit a golf shot. A Canada goose can be very hostile toward anything that approaches its nest. 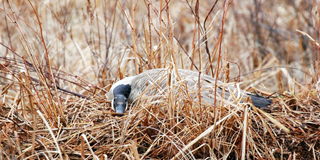 Learning how to recognize nests, how long they will be on the nest, and how to avoid provoking nesting geese will help you steer clear of goose/human conflicts this spring. 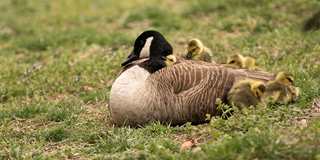 Canada geese have a diverse approach toward nesting. They will nest almost anywhere; bushes, fairways, cliffs, muskrat houses and small islands. Canada geese exhibit very strong family and pair bonds, and tend to return to their natal homes to nest. Artificial structures such as tires, washtubs, and boat docks will attract a goose searching for a nest. Generally, the goose will sit on the nest and the gander will stand guard nearby. They will lay a range of 4-8 eggs per clutch and the eggs will hatch within 25-30 days. Canada geese will renest if a nest is destroyed. What to do if you find a nest on your property? Again, it is highly recommend that you leave the nest undisturbed and try to avoid walking in its area. Having problems with resident Canada geese on your property? Most state agencies provide information on controlling nuisance Canada geese. Too many geese on your property? Contact your state fish and wildlife agency.